Robocar recently became the first car to race through Paris autonomously. The historic moment took place at Formula E’s Paris ePrix event after the Robocar navigated the 1.9-kilometer circuit’s 14 turns without any human intervention whatsoever. 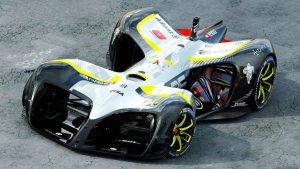 It was an impressive showing for Robocar which promises big things, boasting four electric motors capable of dishing out 400 horsepower and maxing out at speed of 200 mph. The car is capable of “seeing” thanks to five lidar emitters, two radar emitters and 18 ultrasonic sensors, six cameras and two optical speed sensors. From there, a Nvidia Drive PX2 computer that can perform 24 trillion A.I. functions a second crunches all the data.